Surrey County Council not concerned about the safety of riders! Brenda Spencer (pictured) has been trying to find out. Her reply: "The closing times were suggested by the designer and manufacturer of the self closing gate as illustrated in British Standard 5709:2006. There are no times stated in this standard. 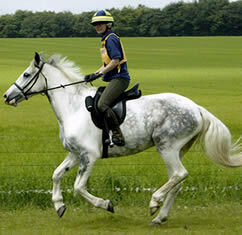 Gates are licenced on public bridleways to prevent the ingress and egress of animals. A self closing gate requires enough energy to close by rising over the catch. If the gate does not close properly then there is the danger of stock getting out onto the road and causing an accident. We do not suggest timings in relation to safety of riders." Is she saying that the safety of riders is of no consideration at all in determining the speed with which a bridlegate should close? If so that is a shocking admission by a public official. Surely the "safety of riders" is an intrinsic consideration in the whole question of how quickly a bridleway gate should or should not close. Or is Claire Saunders saying that in East Surrey the consideration of cattle comes before the consideration of people? But be warned. She will probably only listen to you for 4 - 6 seconds. To her, riders are not worthy of any kind of consideration. We have her word for it.